The trick is to keep a poker face: no blinking, no smiling, no flashing a quick obscene gesture, no going cross-eyed to see if you can crack his stone-cold stare. It's tempting to goof on the North Korean soldier whose face is six inches from yours. It's a juvenile temptation, admittedly, much like getting the giggles at a serious moment in church. But the whole thing just seems so silly -- this 25-year-old North Korean soldier in his olive drab uniform trying to intimidate a bunch of tourists with cameras and fanny packs -- that it's easy to forget that this is anything but funny. Panmunjom is the "truce village" that straddles the border between North Korea and South Korea in the middle of the Demilitarized Zone that has split this peninsula since the Korean War ended in 1953. The DMZ is probably the most fortified border on Earth, with more than a million soldiers facing each other with enough artillery to obliterate each other in a matter of hours. Tension constantly runs high here -- more than 50 Americans, 1,000 South Koreans and countless North Koreans have died in skirmishes along the DMZ in the past 40 years, including one recently. The DMZ is dotted with land mines and razor wire and concrete tank bunkers and Communist soldiers dug into mountainsides behind cast-iron "blast doors" to protect them against bombs dropped from American B-52s. It's one bad place, but it's also a huge tourist draw. Every year, about 180,000 tourists are bused up from Seoul, 30 miles to the south, to spend a day in the clean air and wide open spaces of the last flashpoint of the Cold War. Think of it as Dangerland, a bizarre theme park to cataclysmic mass death. I'm not sure I'd recommend the DMZ as a holiday destination in itself. But for anyone who plans to be in South Korea on business or vacation anyway, this place is not to be missed -- it's one of the weirdest and most fascinating places you can reach in a tour bus. You know you're not in Disneyland right away, when you are asked to sign a release that notes that your trip to Panmunjom "will entail entry into a hostile area and possibility of injury or death as a direct result of enemy action." The release also bans speaking or associating with the North Korean soldiers, as well as pointing or making gestures or expressions that the North Koreans might twist into propaganda. Easier said than done. On one of my visits to the DMZ, I stood against the glass looking back at one of the North Koreans, trying not to laugh, when a South Korean woman on the same tour broke into tears and ran behind one of the U.N. soldiers for protection. South Koreans have been living with the very real danger of another North Korean invasion for a generation. To this woman, seeing the North Korean soldiers up close was like meeting the Devil. Which brings us back to the staring contest with the evil-eyed North Korean soldier. 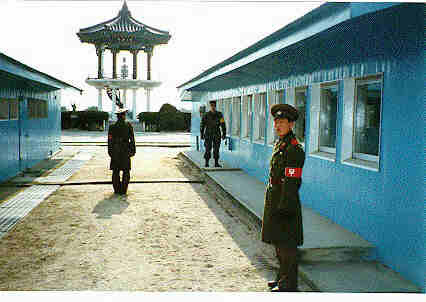 One of the main attractions in Panmunjom is a visit to the powder-blue, one-story building where officials from the two sides meet occasionally. A conference table covered with green velvet is placed directly over the border line, and the microphone cable that runs down the middle of the table is officially recognized as the international border. When tourists are ushered into the building, four soldiers from the U.S.-led U.N. Command, the good guys, stand at either end of the building at rigid attention, fists and jaws clenched, guarding the day-trippers. And like flies to a picnic, North Korean soldiers wander up to the windows and peer in, inches from the tourists. Some of the soldiers smile and wave, others take pictures, but most just press their faces near the glass and scowl with a look that says, "You are a pathetic capitalist pig, and I would like to rip your lungs out." But North Korea is a nation in crisis, where millions of people are threatened with starvation because of a dying economy and severe food shortages, so my guess is that these guys are really thinking something like, "Man, look at those fat tourists." Tourists are warned not to make eye contact or gestures of any kind. If a tourist waved, a North Korean soldier might take a photo that could easily end up in a Stalinist propaganda publication with a caption like, "Defector begs a glorious patriot from the Korean People's Army to save him from Imperialist oppression." Nobody takes this too seriously, but it's still against the rules to wave. As soon as your tour bus leaves Seoul, you start to get the idea that things are a little different here. "Freedom Road," the only way to Panmunjom, is a major divided highway that is about 12 lanes across in some places. The median strip is massive and flat, just right for a wave of tanks and artillery to head north to repel an invasion. Those odd little structures up in almost every hill? Yup, those are machine gun emplacements. And so are those piles of sandbags in the median strip. The road stretches along the banks of the Imjin River, which is lined with one continuous eight-foot fence covered with razor wire and dotted with hundreds of military watch posts, all manned by a solitary soldier. The river itself is filled with nets and spikes and other obstacles to prevent North Korean soldiers or vessels from coming south. Huge lighted signs bearing Korean letters face the North Korean side of the river, touting "Freedom" and "Democracy." At Imjingak, the last village before the DMZ, buses line up next to a large display of tanks and planes and other equipment used in the Korean War. The buses must wait for permission to pass over a one-lane bridge, the only way to Panmunjom. Soldiers inspect the bus, and clear it to drive the last couple of miles to the DMZ. Along the way, the bus passes under several concrete structures that appear to have no purpose. These are tank traps, which can be collapsed with dynamite to prevent enemy tanks from rumbling south. First stop is Camp Bonifas, a small collection of buildings surrounded by triple coils of razor wire just 440 yards south of the DMZ. If it weren't for the land mines and armed soldiers, the place might look like a big Boy Scout camp. About 500 U.S. and South Korean soldiers live in Bonifas and other bases close to Panmunjom. They are the closest soldiers to North Korea, and they are on constant alert for a North Korean invasion. When the tour buses arrive at the gate, a soldier comes aboard, salutes and barks out the motto of the soldiers stationed here, "In front of them all." From that point on, tourists in the DMZ are under constant guard by U.N. soldiers. They keep tourists from straying out of authorized areas, but mainly they are there to protect the visitors from enemy attack. They also make sure tourists take pictures only at authorized spots, as almost all photography here is banned. All tourists are required to sit through a slide show about the DMZ, which recounts some of the historical highlights, such as the 1976 deaths of two U.S. soldiers (including the camp's namesake, Maj. Arthur G. Bonifas) who were hacked to death by ax-wielding North Korean soldiers as the Americans tried to trim a tree in the DMZ. Camp Bonifas has a tiny one-hole golf course with a peeling Astroturf green, surrounded on three sides by minefields. Sports Illustrated magazine visited a few years ago and dubbed it "the most dangerous hole in golf." Indeed, at least one errant shot exploded a land mine. All tours to the DMZ include a stop at the Monastery, the Camp Bonifas canteen, which has a sign calling it the "Home of the Merry Mad Monks of the DMZ." It's a small, dark building where tourists can buy DMZ baseball caps and coffee mugs and Snickers bars for 50 cents. There are basketball and tennis courts across the streets, but I've never seen anyone using them on several visits there. It's not a tennis kind of place. Almost all the tourists who come up here are foreigners because South Koreans need a special government permit to visit Panmunjom. Many of the visitors are Americans, including some who fought in the Korean War, their families, history buffs or just backpackers trekking around Asia looking for a little counterintuitive tourism. A trip to the DMZ jerks the visitor wildly between cold moments of absolute deadly seriousness and memorable instances of pure goofiness. At the center of Panmunjom, visitors can look across at North Korean tourists gawking at them from a large visitors center on the North's side and North Korean sentries staring back at them through binoculars. It's serious and quiet here, with soldiers everywhere warning tourists against making any sudden or provocative movements. It's the same way when the bus stops at several other military checkpoints where tourists can gaze out across the rocky hills of North Korea. Checkpoint 3 is the tour's most famous stop. This is where U.S. presidents and secretaries of defense stand when they want to have an up-close look at North Korea. Set up on a hill, it seems almost too peaceful to be so dangerous. It's an odd feeling to stand here and be watched by the North Koreans in their guard towers just a hundred yards away. And it's even odder to look out and know that dug into those harmless-looking hills are enough soldiers and artillery to wage a war of unthinkable bloodiness. Inside this eerie buffer zone, there are still rusting military helmets from the Korean War with dandelions growing through the bullet holes. But this isn't like visiting Vietnam, where the war has become a thing of museums and history books. Here in Korea, the war did not end when the shooting stopped in 1953. A cease-fire, not a peace treaty, is in force. The war may be only technically still on, but soldiers here remain on the highest kind of alert. The view from Checkpoint 3 illustrates something else that seems a little odd here. The green hills and vast expanses of the DMZ are filled with rare birds and more than 140 varieties of wildlife. Because the 2 1/2-mile-wide DMZ has hardly been touched by humans in almost 50 years, it has become one of Asia's great wildlife sanctuaries. There are two heavily guarded villages in the DMZ, one in the north and one in the south, which face each other across the minefields. They are visible to tourists, but off-limits for visits. The southern village, Taesongdong, is home to 237 farmers; life is dangerous, but they don't have to pay taxes and they get great prices for their novel produce. The northern village, Kijongdong, looks modern enough, but if you squint through your binoculars, you'll see that the buildings don't even have glass in the windows. It's a lie, a huge Potemkin village designed to give North Korea the appearance of modernity. Back at Camp Bonifas, visitors are welcome to have lunch in Ballinger Hall, the camp cafeteria, which serves up a fine hamburger and fries on tables arranged on a disco-dance floor, in the finest tradition of military bases everywhere. Except for the possibility of immediate annihilation in a shower of artillery fire, it's a perfectly pleasant way to cap the day. Almost any major hotel in Seoul offers daily bus tours to Panmunjom. Cost is about $53 and the tour takes about half a day.